A small group of friends on SCS do a weekly challenge. We upload on Fridays, but since I will be away I did mine tonight. The rules for this challenge were VERY resrictive!!! We had to make THREE cards, and the ALL could only be ONE single layer! We were allowed to use One Punch if desired, one embellishment, and one ribbon on each. The cards had to be appropriate for a birthday card...although they did not have to have a birthday sentiment on them. 1. One card had to be a cutesy animal card. 2. One card had to be a guy card. 3. One card had to be a coffee theme or brown in color. Whew! Talk about hard! I never realized how many layers I use until I was told I could only use one! LOL! So this is my cutesy animal card. I chose this cute little house mouse image from Stampabilities. It's called Buzzy Friends. I stamped with Stazon Jet Black ink and colored with Prisma Pencils and blended with Odor Free Mineral Spirits. I love coloring these little guys... they're so cute! I had to add a little sparkle so on their wings I lightly colored with my pencils and then painted "Shimmerz" in Angel Wings over top... did two coats. Shimmerz is such a great paint! I love the shimmer it gave the wings. I also colored over the lines of the wings with my clear glitter gel pen. The photo does not show it but they are sparkly and really pretty. I added Stickles to the anntenae. I thought this ribbon was about perfect and helped fill the space on this single layer card. Did I mention these card have to be single layers? I'm glad I did this challenge! I never thought a single layer could look good, but it really isn't that bad. I hope you like it... it's good to challenge ourselves every now and then, and this one challenged me! I was dying to layer some black matting on here but I restrained myself! As a multi layer kind of gal myself, I also find single layer cards very challenging, so I understand your struggle - but I think you met it head on! Enjoy your time away. This is precious! House Mouse are some of my favs and I like how you added the stickles. Great card Grace. Those little guys are so cute. Grace - the detail on the card is perfect. I love how the ribbon matches the image. 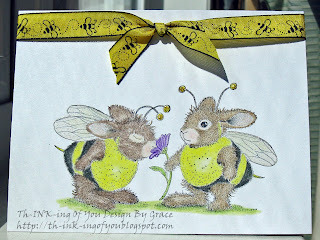 Awwww.....this is adorable and I love the bees on the ribbon! perfect!